I always enjoyed my mother’s version of chicken adobo. It was one of the first dishes she taught me to make. The usual process of making chicken adobo involves boiling the chicken. But I find that by cooking chicken breasts at such a high temperature, in such short amount of time, leaves them dry, tough and lacking depth of flavor. 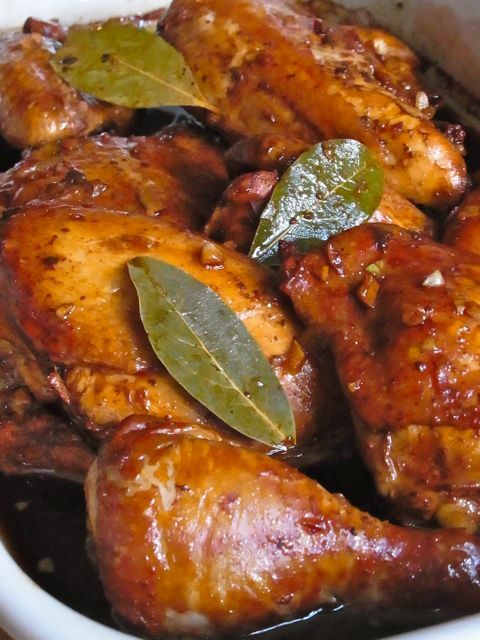 I discovered that by braising, rather than boiling, the chicken along with the marinade, you not only end up with meat that is truly tender and tasty – regardless of the chicken part – but you also end up with a rich, deep, dark, chestnut-brown sauce that is tangy, salty and slightly garlicky at the same time. It begs to be ladled onto your favorite rice. Place the soy sauce, apple cider vinegar, garlic, bay leaves and black pepper in a 9 x 12 x 2” baking dish. Using a fork, whisk these ingredients together gently. Add the chicken pieces skin side down, cover dish with foil, and marinate for at least one hour, but preferably overnight. Preheat the oven to 350 degrees. Place the baking dish on the center rack of the oven and bake, covered, and cook for 30 minutes. After 30 minutes, remove the foil and turn the pieces skin side up and continue baking for an extra 20-30 minutes, or until the internal temperature of the thickest part of the breast reaches 165 degrees. Serve warm with your favorite rice. Yummy Yummy. This is my families favorite dish. Hi Vanitey. It’s a pretty good one!